The nonuniform distribution of clothes within a washing machine can produce notable vibration and noise. 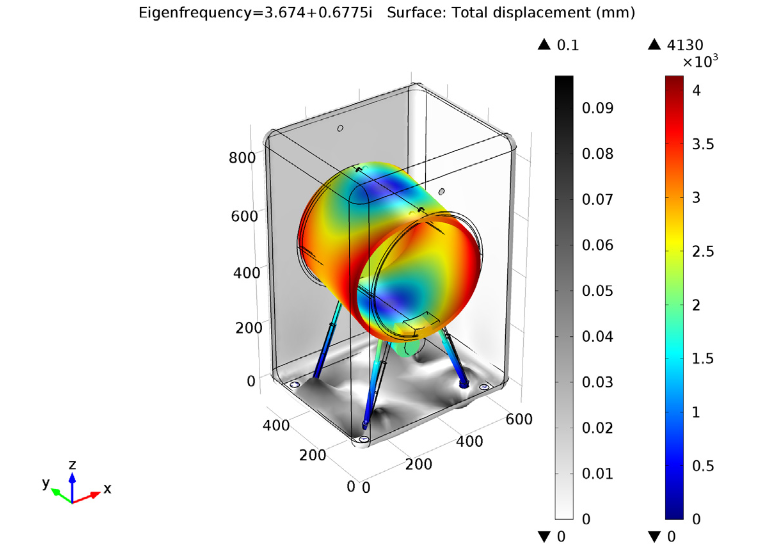 Modeling the dynamics behind this movement and sound can be a valuable tool in optimizing the design of these common household devices. When buying a home, there are several modern conveniences that people look for. One of these is often a washing machine. Having this device within your own home eliminates the time-consuming task of taking your clothes to the laundromat or washing them by hand, giving you the freedom to tackle other tasks around the house — or better yet: relax. Imagine that it’s laundry day and you are fortunate enough to have a washer in your home. How would you notice that your laundry cycle is complete? One common tell-tale sign is silence. During the cycle, your washing machine is likely to produce vibration and noise, a result from the uneven distribution of clothes and the structural properties of the machine. We now have a multibody dynamics model that enables you to analyze this common issue via simulations. The Vibration in a Washing Machine Assembly model depicts a horizontal-axis portable washing machine. 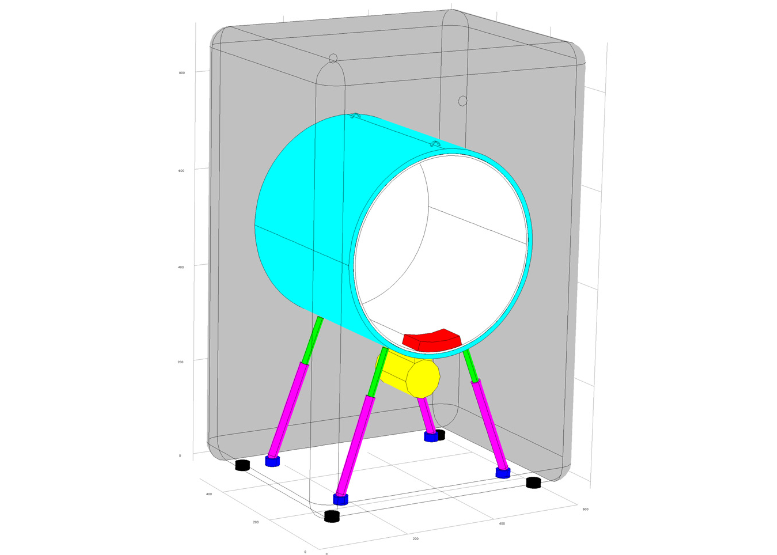 The model’s geometry accounts for various parts of the washing machine assembly (including the housing), with varying components defined by different colors. The geometry of the washing machine. 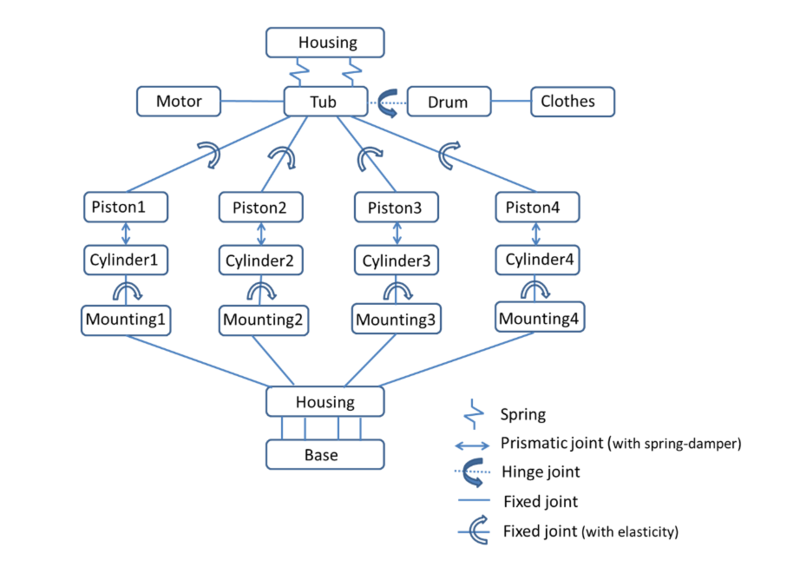 Within this multibody dynamics example, we assume that the housing is modeled as a flexible shell and that the other components of the washing machine are modeled using rigid solids. Additionally, we assume that the clothes do not move in relation to the drum. The diagram below explains the connection details between various parts of the machine through the use of joints and springs. 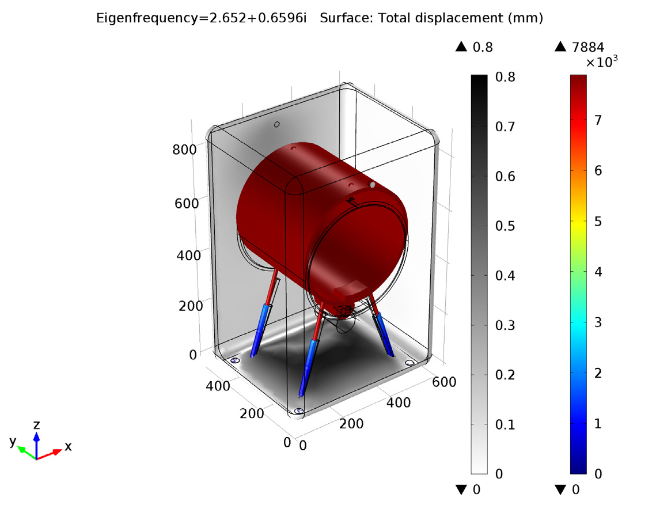 In an eigenfrequency analysis, one mode focuses on the translation of the tub and another shows the rotational motion of the tub about the vertical axis. 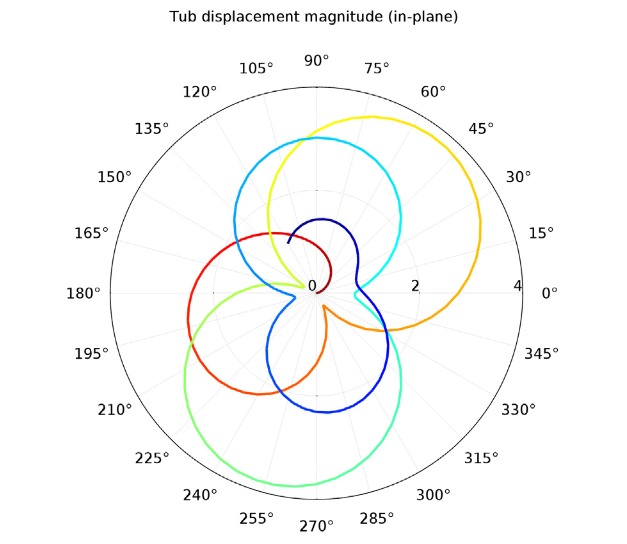 Each of these eigenmodes highlights the corresponding deformation of the housing, which is relatively small compared to the motion of the tub. On the left: The translational tub mode. On the right: The rotational tub mode. 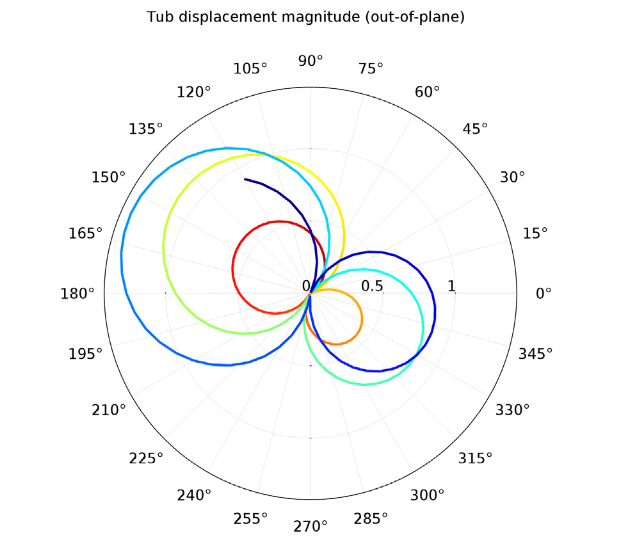 The next set of figures shows the displacement magnitude of the tub with the angular position of the unbalanced clothes for the full time duration. Here, the color red represents the initial time of the trajectory and the color blue illustrates the final time. 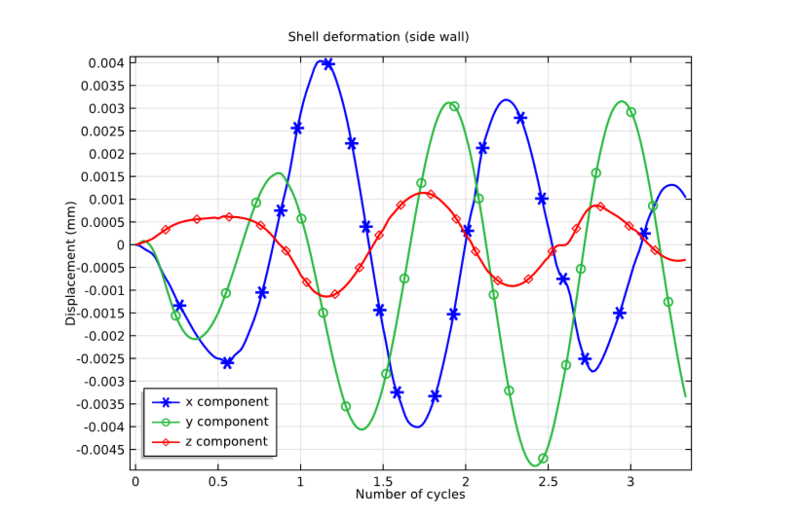 To identify the vibrations induced in the housing during the machine’s spinning cycle, we can perform a transient analysis. The graph below depicts the housing deformation in multiple directions at a point on the right side wall. 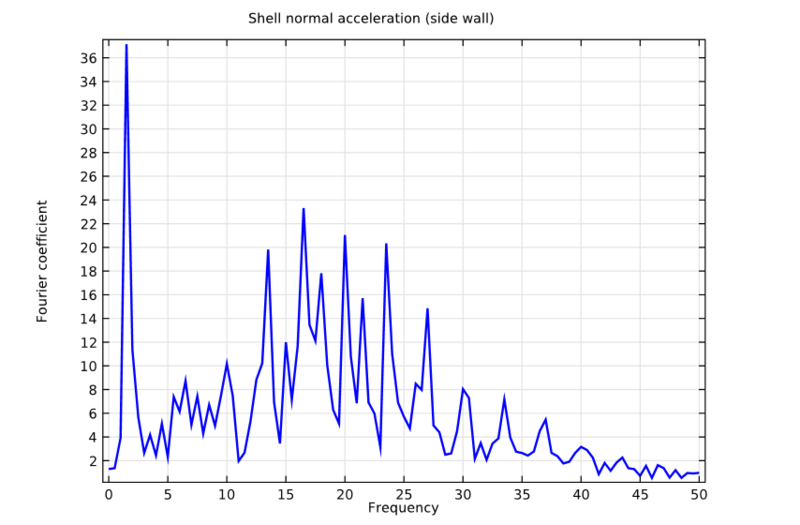 Next, we can analyze the normal acceleration (a measure of noise emitted by the side walls) of the housing at a point in the middle of the right side wall. These results are illustrated in the graph below on the left. Meanwhile, the graph on the right depicts the frequency spectrum of this acceleration. We can note that the frequencies of the side wall vibration are predominantly within the range of 0-30 Hz, with a peak of around 1.67 Hz, which can be considered the excitation frequency. 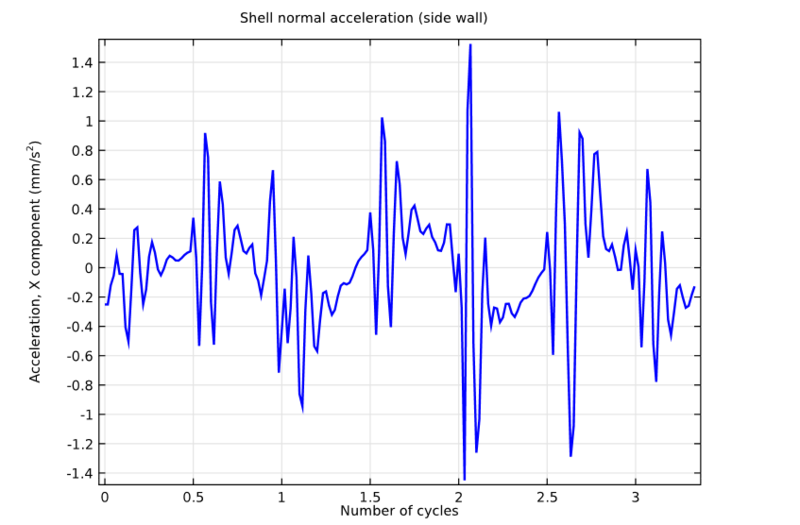 This corresponds to the frequency expected from the inertial mass ratio of the drum and its load at the set rotational velocity. Yet, it is interesting to note that the frequency of the side wall vibration also occurs at higher values than the excitation frequency, which leads to an additional emission of noise. With this in mind, the washing machine can be designed to mainly emit noise at lower, non-audible frequencies. The choice of materials and design must also ensure that the washing machine is structurally strong enough to limit the vibration magnitude at all frequencies in order to prevent the failure of its components.